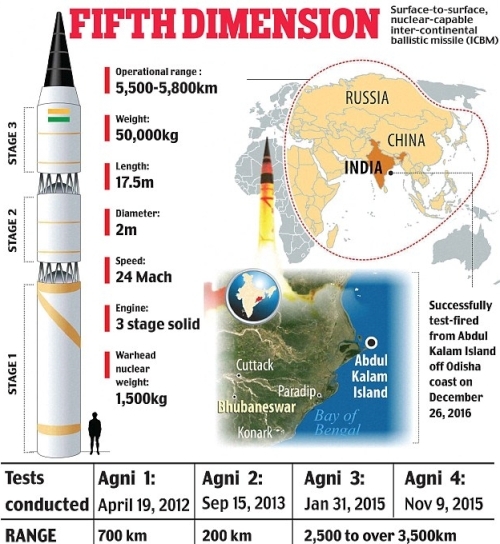 With its successful fourth test-firing, India is now ready to induct its 5,000km+-range intercontinental ballistic missile Agni-5, into the country’s (nuclear) Strategic Forces Command (SFC).The missile with its range provides India the capability to strike each and every corner of its traditional adversaries from all possible corners of its territory. A senior DRDO source said: ‘The missile would now be ready for bulk production and induction in to the SFC which will then carry out user trials from the produced weapon systems’. The DRDO has developed new technologies for the missile system which help it in terms of navigation and guidance, warhead and engine, they said. The new technologies worked perfectly in the system as the missile landed in Pacific region after it was launched from the Kalam Island in Odisha. ‘The full range test-flight of the missile has further boosted the indigenous missile capabilities and deterrence level of the country,’ the Defence Ministry said. The very high accuracy Ring Laser Gyro-based Inertial Navigation System (RINS) and the most modern and accurate Micro Navigation System (MINS) had ensured the missile reached the target point within few meters of accuracy, DRDO officials said. While the first test of Agni-V was conducted on April 19, 2012, the second was on September 15, 2013 and the third on January 31, 2015 from the same base. DRDO sources said the organisation would now work upon improving the technologies involved in the missile system and try to better them for future usage. The entry of India into the Missile Technology Control Regime will also help India to further strengthen its indigenous missile program.